The 712 Mototracteur models where rare, it is thought only some 200+ where produced from the 1955 model A (with the model B starting in 1956). They initially used the same identification plaque as the 411 with the numeric notation 70***, and in 1956 the mototracteurs used its own identification plaque. 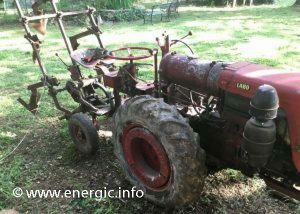 The mototracteur where found to be difficult to maneuver, with poor weight distribution In the working environment – it was necessary to have additional weight/s added at the rear to enable this mototracteur to perform its basic functions. 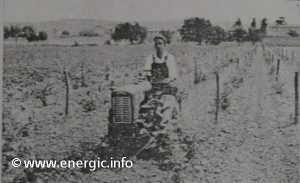 Staub, of the time, offered a better mototracteur alternative and the Energic mototracteur 712 was phased out. 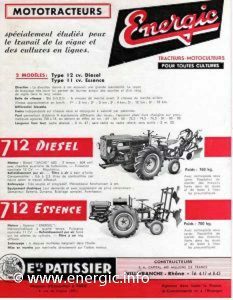 Later to be replaced with the extensive 4RM tractors, they where worthy competition to the Staub and other direct competitor ranges. Engine/Moteur. Sachs Single cylinder 604cm3, 12-14 cv, 2 stroke Air cooled, alésage 88 x course 100, as per 712 d. With a chamber of pre-combustion. Injection – Bosch. Compression 20:1. 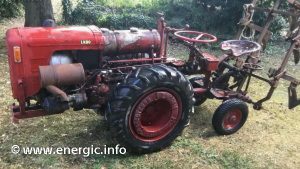 Energic 712 diesel mototracteur rare sight. 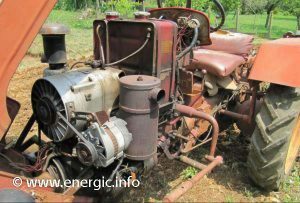 Here is the engine in the tracteur. Lubrication. By constant circulation of oil held within the sump of the engine. The circulation pressure being attained from crankcase compression. Cooling. One large aluminium fan which is mounted at the front of the engine, running on ball bearings. This system draws air into the hood circulating around the engine, ensuring cooling. this system was tested in extreme high temperatures and proved effective. 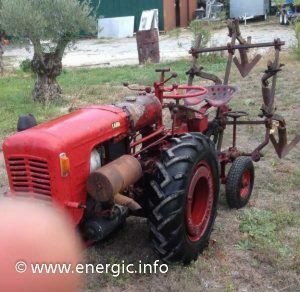 Energic 712 diesel mototracteur ready for action. Starting. 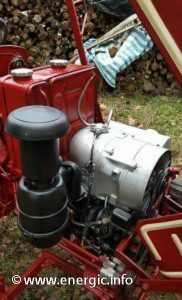 Electric starter moteur or by hand crank, direct on to the motor, – located at the front of the engine. Injection. Bosch, high pressure tubing, porte injecteur. Presser of injection 120 kg/cm3. Air filter/Cleaner. Filter in a bath of oil. Gears. Box Bté S.G.D.G.The three speed gear box is built within the engine offering 6 forward and 3 reverse gears depending upon the options.this operates through a lever (lower left hand side facing forward from the seat) giving low/high ratios 1/4, 3/6, 2/5.The right hand lever operates in 3 positions, furthest toward the front of the mototracteur is reverse, center is low speed and towards the rear is high speed. 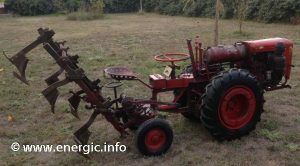 Energic Mototracteur 712 Diesel 12cv hoeing. Reverse. 3 speeds are available in reverse depending upon the options. Clutch. Mono disc sec, within the chassis casing. This operated from a lever pulled up under the left hand side of the steering wheel. Energic 712 diesel mototracteur rear view. Steering. executed by up right steering wheel, direct shaft on to gears that rotate around a geared semi circle connected to the rear section of the mototracteur. Wheels. Pneumatic Tyre wheels 750 x 18 front and trailing small wheels rear. Nine additional overall widths are available;64, 66, 68, 72.5, 74.5, 76.5, 81, 83 and 85 cms. (some literature states Wheel width is regular-able between 0.53m and 1.03m) These are obtained by altering the wheels into different positions. Blockage independent for each wheel. Energic 712 diesel mototracteur rearview with rack . Hitch. All implements are attached to a 3 metal bar rack system. 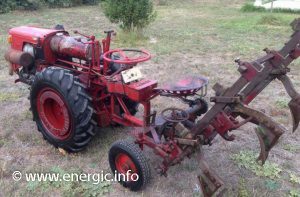 Where you can attach implements such as ploughs, hoes etc., in many variable positions depending upon the type of work required. Careful use of the manual lift and weight allows the operator to alter and maintain the draft and other characteristics required to operate the implements at different depths and pressure. Alternatively you can opt for a hand operated link system for a plough and no 3 metal bar rack frame. Alternative hydraulic system see below, or hitch system for brabant ploughs. Ploughing depth. Up to 12 ins (30,48 cms) dependent upon soil conditions. (greater depth with a link plough than the 3 metal bar rack frame). Energic 712 diesel mototracteur side view. Fuel consumption. 0.6 to 2.3 liters of fuel per hour dependent upon working conditions. The tank holds approx. 9 liters. Throttle control. Operated from beneath the right hand side of the steering wheel (while positioned facing forward). Weight. 760kgs With additional wheel weights of approx. 25kgs single or (50kgs) double. Also it is possible to fill the tyre with water for extra traction and weight. Speeds.With 1st gear giving 2kms – kmph, 2nd – 3kmph, 3rd – 4kmph, 4th 7kmph, 5th 12kmph and 6th gear giving 18kms per hour. Additional electrical equipment. Starter, Battery 45/60 (amps/hours), dynamo, lights, horn. Brakes. Independent on each wheel, operated from the near the steering wheel. Dimensions. 3m 47cms long, (without any back tools, frame etc., 2m 20cms). The price in 1963 was 9,088 francs. With accessories priced as follows; and common to the petrol and diesel models. Hoe 5 toe, mounted on the rear 3 metal bar frame 303 francs.Weight 28 kgs. 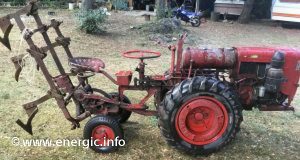 7 dent cultivateur mounted on the rear 3 metal bar frame 276 francs. Weight 36 kgs. 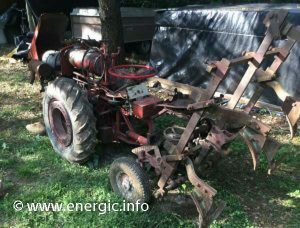 1 soc Butteur (in French) plough mounted on the rear 3 metal bar frame 355 francs Weight 19 kgs. 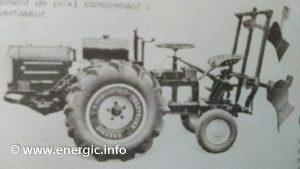 A special adaption was a fitment for a brabant plough and fitment universal expensive at 168 francs. Weight 35 kgs. Later on in its production the 712 was available with an electric circuit for lights, comprising of a alternator, rectifier and small 7ah battery. The price in 1963 factory fitted was 357 francs, or bought as a after sales accessory 335 francs. According to the 1/02/1963 price list. And interestingly there is a quote for a hydraulic lift 1645 francs weight 92 kgs. TVA inclusive (in addition wrapping, delivery and local taxes of 2.82% to be levied). 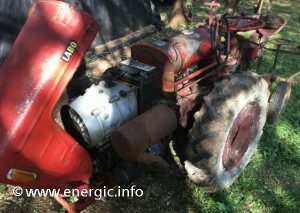 Read more about the Energic Mototracteur 712 petrol here.